What is the Part P Domestic Installer Scheme? 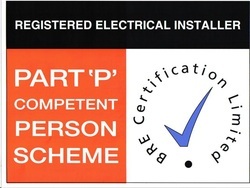 NICEIC's Domestic Installer Scheme has been approved to register installers to Full Scope or Defined Competence for domestic electrical installation work in accordance with Part P Building Regulations. The scope of work covers the full range of domestic electrical installation work. This is those businesses that carry out electrical installation work as the main part of their business. However, other businesses wishing to be registered as full scope, must provide level A type work for assessment (see definition matrix below). If the main activity of the business is not electrical installation work and involves only additions to existing circuits, then the Defined Competence route will be more appropriate. The approach to registration with NICEIC's Domestic Installer Scheme is the same for Full Scope and Defined Competence.